channelcentral Seminars are concise 1-2 hour sessions. All of our seminars are written with IT Vendors and the Channel in mind to help you solve common business problems such as long quote-to-order cycles, maximising order value, motivating sales teams, working to procurement frameworks, demonstrating ROI and much more. 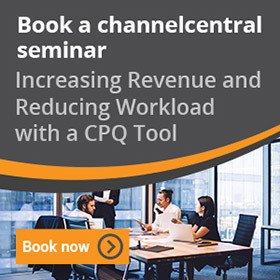 Each seminar has been designed to be interactive to involve your key team members, encouraging a healthy debate around the topic in question with a steer from channelcentral IT Channel experts. These sessions are completely free and channelcentral will work with you before the Seminar to ensure your objectives are met. If, for example, you need to make your quote-to-order cycle more efficient, we will work on content to suit you and the audience. The more information you can provide us with before the Seminar, the more you will get out of it, as the content can be completely tailored to your organisation. After the Seminar, delegates can be assured that they will have a clear idea on what solutions need to be put in place. As a thank you for attending a channelcentral Seminar, delegates can book a free* consultancy session with our experts. The free* consultancy session is designed to work with the decision makers from your organisation to provide precise detail and advice on the best solution. WHAT CAN YOU EXPECT TO GET OUT OF ATTENDING A CHANNELCENTRAL SEMINAR? Our main objective is to ensure our attendees leave the session with a clear perspective on why they have the issues in question and what solutions can be put in place. WHO SHOULD ATTEND A CHANNELCENTRAL SEMINAR? The sessions are designed for Senior Leaders and Sales/Product Management. Group sizes vary but typically each Seminar would be between 5 and 20 people. WHERE ARE THE CHANNELCENTRAL SEMINARS? channelcentral Seminars are delivered via a Webinar. For those delegates that are based in England, you can choose to host the session at your premises or channelcentral will welcome you to their Innovation Office in Tewkesbury, Gloucestershire. HOW MUCH DO CHANNELCENTRAL SEMINARS COST? channelcentral do not charge for a seminar delivered via a Webinar or for the time/travel costs of our presenting staff for hosting a seminar in England. In addition, delegates will receive takeaway documents as a reference point and your company attendees have the option to take up free* CPQ consultancy. Any other costs for face-to-face seminars in England (such as meeting/conference room facilities/ refreshments/staff travel costs, etc.) must be met by the request originator. WHEN CAN I ARRANGE A SEMINAR? channelcentral Seminars are subject to availability and requested location. In some cases we may be unable to meet a requested location, or date, or both. We will contact you to discuss your individual requirements on receipt of your request. Submitting a request for a Seminar does not guarantee a Seminar will take place.